ARMY RECRUITING OFFICE : NARANGI (ASSAM) ARMY RECRUITMENT RALLY AT - 8 ASSAM POLICE GROUND ABHAYPURI, DIST BONGAIGAON (ASSAM) From 04 FEB 2019 TO 14 FEB 2019....(From Official Advertisement). 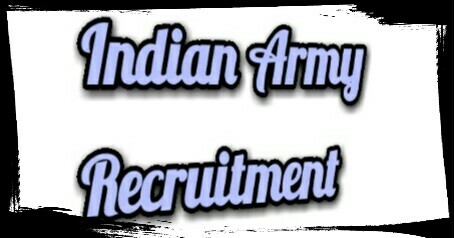 Indian Army, Is Conducting Army Recruitment Rally In 8 Assam Police Ground Abhaypuri, District Bongaigaon. So Interested People Can Apply Online For It Within 31st Of December, 2018. Dear Applications Kindly Go Through The Official Notification For More & Better Understanding, It's Given Below. Soldier Clerk/Store Keeper Technical/Inventory Management. Total Number Of Vacancies → Currently There's No Information About The Number Of Vacancies. Age Limit →For Soldier General Duty You Must Be Born Between 1st Of October, 1997 To 1st Of April, 2001, & For The Other Four Post 1st Of October, 1995 To 1st Of April, 2001. Educational Qualifications →There Are Different Requirement For Every Posts, So It's Better You Check The Official Advertisement For Accurate Information. Mode Of Examination/Selection Process →Physical Measurement/Physical Fitness Test/Medical Examination/Common Entrance Examination. Online Application/Examination Fee →Haven't Mentioned In The Notification. Last Date For Online Application Form→31st Of December, 2018. Date For Recruitment Rally (Assam) →From 4th Of February, 2019 To 14th Of February, 2019. Admit Card Download → You Will Get An Admit Card On Your Registered E-Mail. Result →For Indian Army Open Rally In Assam 2018 Result, Click Here The Official Website. Now Apply For This New Vacancies In Army Open Rally In Assam 2018-19, Down Below. All The Best & Do Visit Here For Daily Government Jobs News Alerts & More About Darjeeling District, Till Then Stay Safe And Blessed.